The succulent Slow-Cooked Pulled Pork Sandwich recipe is a blueprint to the ultimate sandwich that will leave you and your guests full and satisfied! 1 Arrange pork in large nonaluminum roasting pan or baking dish; set aside. Combine 1/4 cup brown sugar, 1/4 cup paprika, garlic powder, onion powder, cayenne pepper and water in small bowl; rub onto pork. Cover and marinate in refrigerator 3 hours or overnight. 2 Preheat oven to 350°. Cover pork with aluminum foil. Bake 3 hours or until pork is very tender. Let stand 30 minutes. Pull meat from bones and place in bowl; set aside. 3 Bring remaining 1 Tbsp. brown sugar and 1 Tbsp. paprika, soy sauce and rice wine vinegar to a boil in small saucepan. Simmer, stirring occasionally, 10 minutes. Pour sauce over meat and toss well. 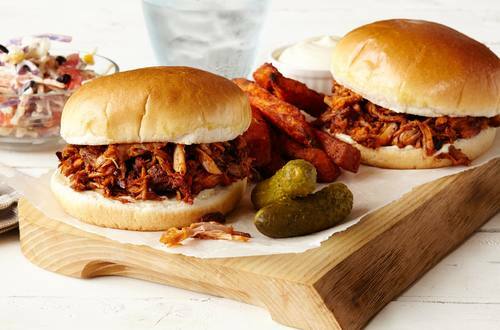 4 Spread buns with Hellmann's® or Best Foods® Real Mayonnaise and fill with pulled pork.